I never tried to paint before. I have always been a seeker of beauty, a lover or art and a wondered at God’s glorious creation. I look at a tree or the sky and think about all the colors it would take to paint the scene, but I have never lifted paint to brush. 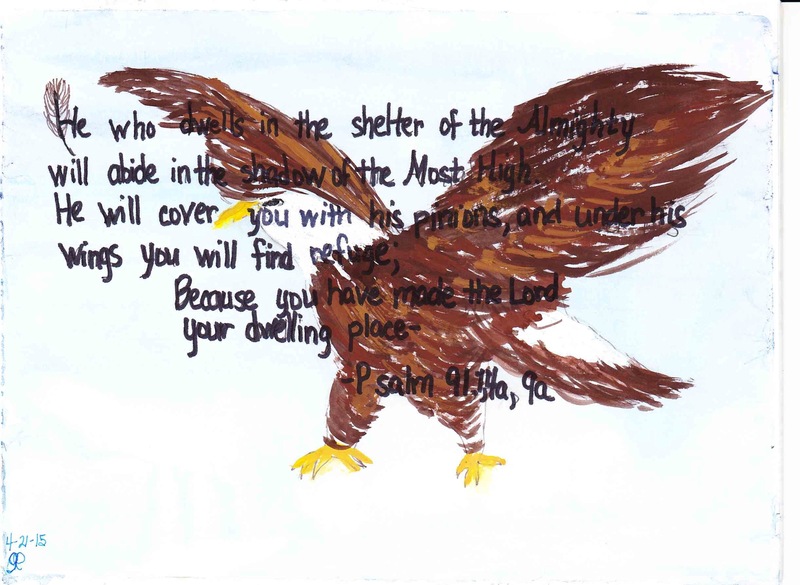 In the book study on Spiritual Whitespace, author Bonnie Gray encouraged followers to pick a favorite verse write it on the page and illustrate it with watercolor. To be daring I tried this. I was inspired by the image of an eagle protecting it’s young. There was a now famous pair of eagles in Pennsylvania who valiantly protected their young through the winter snows. With no experience I did not consider that the paint of the eagle would cover over the verse beneath it. When I copied back over I transposed the terms Most High and Almighty. Anyway, I am sharing this because for me trying to paint was similar to other people jumping out of airplanes, or BASE jumping. I survived! I am using the fun of painting as a witness to God’s grace and goodness. What daring thing can you try to proclaim the glory of The Lord?